When 9 legislators out of 105 lead an increasingly violent movement to topple an elected government via what ultimately ended up becoming a low-intensity “military coup”, it’s usually a worrying sign that dictatorship and not democracy is right around the corner. The Armenian Color Revolution was a success, and hyper-nationalist politician and small-time oligarch Nikol Pashinyan was able to pressure former President and now former Prime Minister Serzh Sargsyan to resign from his position despite the latter’s insistence just yesterday morning that “the political force, which garnered 7-8% in the election, has no right to talk on behalf of the people” and “blackmail the state”. 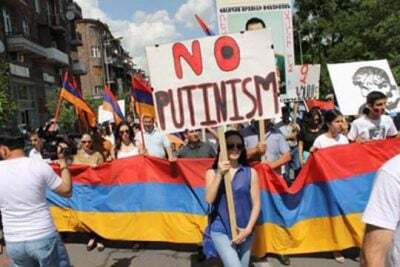 The end to his government came swiftly after his newfound EU allies betrayed him by demanding that the police release Pashinyan and the other arrested provocateurs (which might have included two suspected bombers), which Sargsyan promptly complied with earlier today. This coincided with hundreds of troops rushing out of their barracks and joining the “protesters”, prompting the patriotic representatives of the military to vow harsh legal punishment against all of the deserters. Unfortunately for the constitutional order of the state, the now-former Prime Minister followed in his Ukrainian counterpart Yanukovich’s footsteps and refused to use force to resolve this Hybrid War crisis, choosing to resign instead of carry out the legal duty that was entrusted to him by his countrymen in restoring order to the streets. At this point, it’s unknown whether the conspiring troops were let out of their bases by some of their commanding officers who may have sympathized with the Californian diaspora–backed Color Revolution or if they disobeyed their superiors en mass and stormed out into the streets after overpowering the guards (some of whom may have also joined in), but whatever the case may be, this incident demonstrates a serious fracture within the armed forces that will surely continue to be exploited. The combination of potentially “rebellious” military men in the streets coupled with a minority of hyper-nationalist Color Revolution politicians who have demagogically taken control of thousands of young minds in blackmailing the state to back down before their regime change demands implies that Armenia won’t see what is superficially regarded as “Western Democracy” anytime in the near future but could worryingly see the sort of dysfunctional dictatorship that has since formed in fellow “revolutionary” Ukraine, whose “EuroMaidan” events in Kiev nearly half a decade ago closely mirror what just happened in Yerevan. As for the international implications of this successful coup, the author wrote an analysis from last week about how “The Yerevan Protests Might End Armenia’s Unconvincing ‘Balancing’ Act”, and it’s recommended that the reader at least skim through it and some of its cited articles if they’re unfamiliar with this forecast. No matter how “convincingly” the globally powerful Armenian diaspora (and especially those headquartered in California) attempt to “spin” America’s latest Color Revolution success as a “victory for democracy and the people”, it shouldn’t be forgotten that Sargsyan caved in the face of EU pressure just like Yanukovich did and allowed his government to be toppled by a political force that he himself hypocritically said approximately 24 hours before his fall was only representative of 7-8% of the population and “had no right to talk on behalf of the people” or “blackmail the state”. It can only be speculated what happened in the intervening day to get him to so quickly change his mind, though it might have had something to do with the low-intensity “military coup” that began to unfold by what may have been “rebellious” troops. Either way, democracy didn’t win in Armenia today – dictatorship did – and the future of the country hasn’t looked bleaker in recent memory, though just like in the immediate aftermath of “EuroMaidan”, the majority of people there haven’t realized it yet and some of them never will.